Bike racks were originally built more for public usage. Popular public storage bike racks included the “Sheffield Stand” after the city of Sheffield in England and the “Post and Ring” bike racks of Toronto, Canada. However, with the passage of time, various garage bike rack systems have become more personalized and people started inventing racks for personal storage. 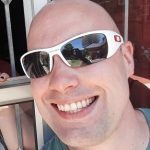 Here we’ve set out to review those garage bike storage systems that consistently receive the highest ratings and positive feedback from thousands of buyers on Amazon.com. We continuously scour the web for new bike storage designs and evaluate their performance in the market and level of customer satisfaction before including them on this site. Our garage bike rack reviews are objective and aimed at shortening the amount of time you have to spend to find the best garage bicycle rack to fit you needs. When it comes to storing bikes, simpler is better. After all, a long ride is a workout, and when you get home you just want to roll your bike into your garage and get inside for a hot, relaxing shower. The last thing you want is more work. That’s why we like the BIKE HAND YC-96 floor parking rack. No lifting, no pulleys, no hanging, no balancing act – you just roll your bike into its place. When you push your bike onto this rack, the front holder will tilt down to receive the wheel. Smooth and easy. This is a welcome feature if you have a heavy mountain bike, downhill bike, or anything with some heft. The rack comes fully assembled and ready to use right out of the box. No tools needed and nothing to think about. The stand weighs a mere 5.82 lbs. and, by pulling a single knob, can be folded flat for easy storage. This would also be a great rack for traveling with your bikes. It might be a bit large to just stuff into a backpack but taking it along on a bike trip would be no problem. You can store and care for your bikes on the road as well as you do at home. The rack can hold a single bike with a wide range of tire sizes: 20mm wide tire on 650C & 700C road wheels, and2.4-in.-wide MTB/BMX tires in size 20-in. to 29in. wheels. The YC-96 holds on to your bike’s tire at three points, and the bike sits more deeply into the stand than many other racks, providing greater stability. And the wide base, with rubber-protected feet, keeps both bike and stand solid and upright. Use it anywhere – garage, porch, great for displaying bikes, too. The powder-coated finish looks clean and professional wherever you put it. Owners of particularly expensive bikes will appreciate that this rack only contacts your bike on the tires – avoiding scratches and any damage to the disc rotors or cassettes. Built from heat-treated steel, this is a rack that is built to last. There’s no reason why this YC-96 shouldn’t be standing in your garage as long your garage is standing. To us, this is a first-rate product. Quality built, lightweight, portable, and effortless to set up and use. We like the way the front holder on this stand grips the tire and hold it onto the rack securely. The design is very stable, and this stand seems to be meant to have a long life. 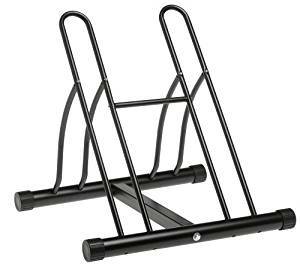 Another contender for first-rate, easy-to-use, rock-solid, go-to floor bike rack is the RAKK bicycle storage stand, made by Feedback Sports. This rack also allows you to simply roll your bike on to the rack, so you can relax and rejuvenate without having to do any lifting or balancing. Give your aching muscles a break. 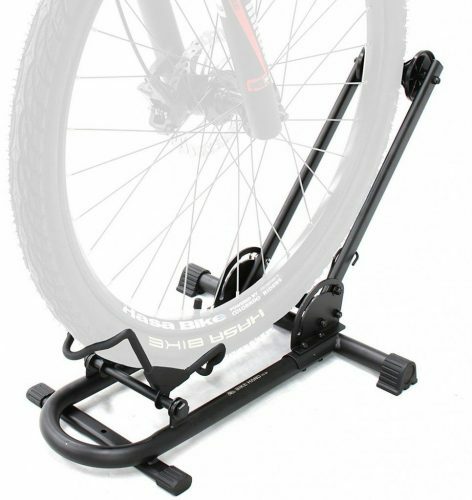 Ready to use out the of the box – just unfold the stand and you’re all set – you roll your bike into the stand’s wheel slot. The slot can accommodate tire sizes from 20-millimeter road tires,up to 2.4-in. wide mountain bike tires with wheel sizesbetween 20-in. and 29-in. The RAKK has a spring-loaded arm that holds on to your bike’s tire. And, that spring arm gives your bike a little push when you are pulling the bike out of the rack – those little things count. You can load in the front or back wheel. Only the tire makes contact with the stand, so there’s no risk of scratching or damage to the rim or spokes. The RAKK has an extremely efficient compact design – the base footprint is 13.5 in. x 13.5 in., which is not much larger than a single floor tile.At a svelte 5.9 lbs., you can carry it anywhere easily. And when you fold it down for storage or to take it out bike tripping, it is only 3.5 in. tall. – this one just might fit into your backpack. The look of the Feedback RAKK inspires confidence. We immediately noticed the square steel tubing that the base and spring arm are made from – it just looks tough. The design is simple and solid.Thanks to the modular design, the Feedback Sports rack might be the right choice for you if you want to store multiple bikes in a minimum of space. Need to hold two bikes, but still want simplicity of design, setup and use? The Velo Cache 2 Bike Storage Rack by Feedback Sports is a great choice. Looking like a particularly stylish (and unusually tall) coat hanger, this stand provides a surprising number of useful features.You’ll have to do a bit of work to assemble this rack, but it seems simple enough. The Velo Cache is a free-standing rack that will hold two bikes of various sizes, up to 80 lbs. There is no need to mount this rack on a wall or the ceiling – its tripod design keeps it upright and steady. 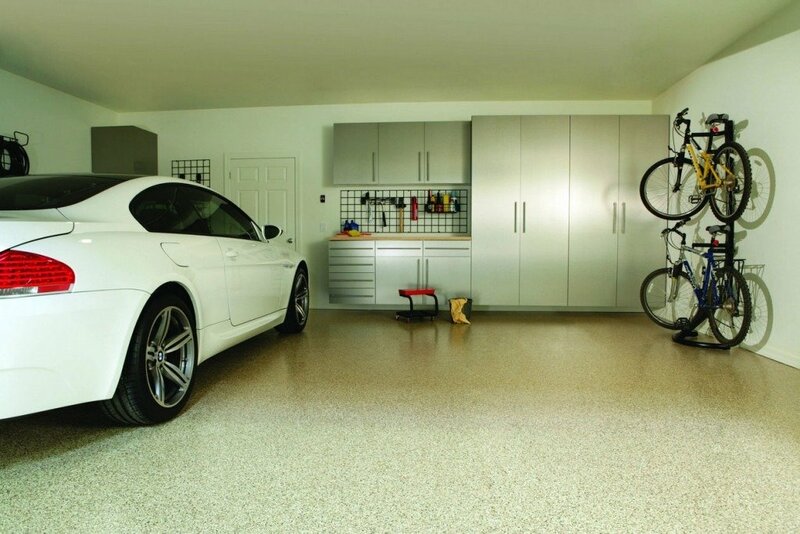 What is impressive is that ittakes up very little space in your garage or shop. When the stand is placed flush against a wall, the tripod will only stick out about 24 in. This ideal for a crowded garage or workspace, making an empty wall or any unused space quite useful. The rack stands about 84 in. tall. Made of anodized aluminum, the rack has heavy-duty steel cradle arms that extend out 10 in. from the stand to hold the bikes. You can adjust the arms to various heights to accommodate all sizes and types of bikes. Soft rubber covers the arms to protect that gleaming polished finish on your bike. The stand is stable enough to store one bike on the top of the rack while you take the other one out for a spin. It is possible to expand the Velo Cache from a two-bike rack to a four-bike configuration with the Expansion Kit offered by Feedback Sports. The kit gives you two more arms, and the hardware needed to mount the arms to the stand. But this option is not cheap: It will cost you a neat 40-dollar bill to double the capacity of your rack. It also takes a bit of planning to figure out how to place the bikes on the rack, so they will fit. It also requires a bit more space than the two-bike configuration. Some people might be tempted to use this rack as a work stand to make repairs, tune-up gears, lubricate the chain, etc. But this doesn’t seem like the best idea to us. Not only is there the problem of balance – no one wants a heavy mountain bike crashing down on them – but putting too much weight or torsion on the screws holding the rack together could be a real problem. It’s a storage rack, and that’s what it should be used for. The Velo Cache seems like an excellent storage solution for two (or four) bikes. It’s solid, stable, not to mention that it looks quite good holding those bikes – it’s available in black and silver. Would be great for displaying your favorites or for bike shop owners to give their customers a great look at what they have on offer. Plus, it requires no mounting, does no damage to your walls or ceiling, and you can easily move the whole operation into another space, whenever you like, with a minimum of effort. Downsides: Well, the expansion kit seems a little pricey. And, you have to lift the bikes up on to the rack. Poor you. You can always ask your wife (or your husband, or, you know, whoever) for a little help. For the apartment dweller, homeowners who want to get some use out of an empty hallway, or any cyclist who’sjust a bit short on space, here’s a rack to help you make themost of the real estate you have. The Leonardo da Vinci Single Bike Storage Hook by Delta Cycle is a wall-mounted single-bike rack with a straightforward design. The Leonardo is meant to be mounted to a wall stud – mounting this on drywall is asking for trouble. Delta Cycle provides the installation hardware and instructions. You provide a few tools: power drill, screwdriver, and perhaps a stud finder and a level to help describe a straight vertical line to determine the placement of screws. You also provide a bit of elbow grease. To mount the rack, you must first locate a wall stud. Then, you place your bicycle against the wall, front tire up, with both tires touching the wall. Mark the spot where the front tire touches the wall and measure 12 in. above that spot. That is where you drill your first pilot hole. A level gives you a straight line to find the mark for the second pilot hole, 125 centimeters down from the first. From there, it’s just a matter of driving the screws home to secure the rack to the wall and then standing back to admire your handiwork. To hang your bike, simply rest the front wheel onto the hook. The weight is absorbed by the rim of the wheel. That’s it. The Leonardo Da Vinci rack holds up to a maximum of 40 lbs., and the rack’s rubber-coated hook can accommodate any size, from touring to chunky mountain tires. A thoughtful touch is a clear plastic matte tire tray that attaches to your wall with adhesive tape to protect your wall – the rear tire sits in it neatly so there won’t be any ugly black tire marks. This video will give you a quick look at the mounting process of the rack and the tire tray, as well as the method for hanging your bike. Delta Cycle suggests two wall layouts for those who plan on using several of these racks to hold multiple bikes: The company recommends mounting racks about 64 centimeters apart if you are planning to hang all bikes front tire up; but, you can mount the racks 46 centimeters apart if you want to hang your bikes alternating back wheel up and front wheel up to maximize the number of bikes you can fit on a wall. It’s a minimal and rather stylish little appliance. A simple, elegant design that provides a lot of functionality. We like that. Installation requires a little work, as well as some thoughtful attention to be sure everything is secure. Might take a bit of care to hang your bike onto it – and it might be difficult for children to use. With the RAD Cycle bike lift, you have a two-piece pulley system that mounts either directly to theceiling joists or to a 2 x 4 and then to your ceiling. 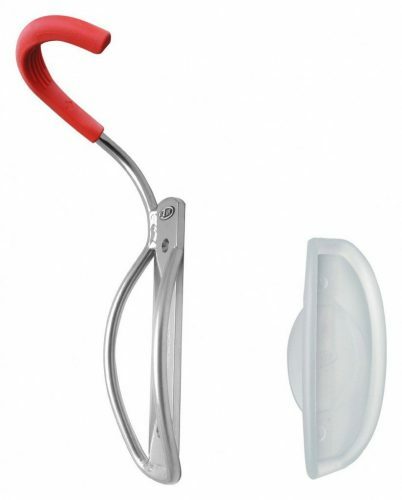 The lift can hold up to 100 lbs., so it is able to handle an extremely wide range of bikes.Two rubber-coated hooks hold your bike at the seat and the handlebars. Once you securely place the hooks, you are ready to use a rope to smoothly pull your bike up to the ceiling. When it reaches the top, a locking mechanismgrabs the rope and acts as a brake to securely hold your bike in place. (The locking mechanism also keeps the rope and bike from slipping back down as you pull up, so you can take your time when hoisting.) Finally, secure the rope to the wall-mount anchor, and that’s it. The lifting seems very easy. It’s almost like beaming up your bike.To bring your bike back down, you just unlock the brake mechanism and ease it to the ground. Watch these guys hoist some bikes to get an idea of how the lift looks and works. The manufacturer recommends using this lift system on ceilings up to 12 ft. The RAD CycleBike Lift Hoist seems to be a well-made and effective bike storage solution. Your bikes are off the floor, up in the air – out of sight, out of mind. 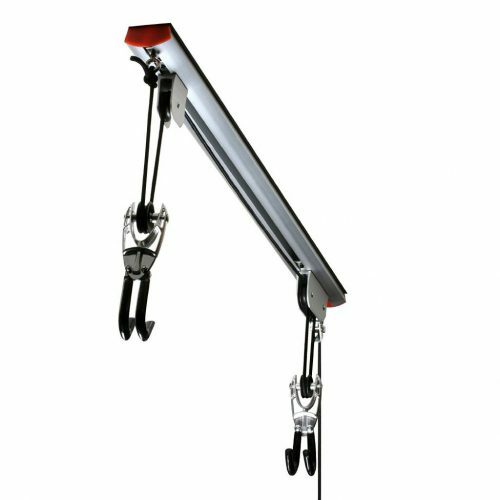 Also, this lift system is quite versatile and could easilybe used for other purposes, such as storing ladders, benches, chairs, anything the system’s hooks could hold on to safely. We have heard a few complaints about the screws included with the lift. Some users have suggested that using somewhat heavier fasteners might a good idea. It seems like good advice – there’s a lot of weight resting on those screws. And the pulling, twisting, and turning from raising and lowering bikes adds movement to the weight. It is also necessary to make sure your ceiling is high enough to use this system You want to make sure you will have enough headroom to pass under your bikes – they will be hanging down from the ceiling, after all. The Delta Cycle Michelangelo is another great space saver for anyone in cramped quarters – studio apartments, roommate situations — or for those just looking to get little utility from a blank wall or other unused area. This cleverly designed rack uses the force of gravity to provide stability. The rack does not need to be anchored to a wall – the weight of the bikes pushes the stand back into it, providing stability. But the manufacturer includes a simple mounting kit consisting of a nylon strap that you can screw intoa wall stud, so you can secure it more fully if you wish. Rubber bumpers on the rack protect your walls from damage. The Michelangelo requires some assembly to put into use, but everything you need is in the box – no additional tools are needed. The parts slide neatly together. Then you tighten a few M5 bolts, twist on the holding arms, lean it against the wall, and there’s your stand. Ready to receive bikes. You can do it all with your bare hands. This video gives you a look at the assembly and use of the rack. What is interesting about this rack is that the holding arms are not attached to the frame – no bolts or screws hold it in place. If you look at the video, you’ll see that the end of the arms that fits on to the frame is covered in rubber. That rubber grips the frame to hold the arm, and then the weight of your bike provides the leverage that holds the arm and your bike tightly to the frame. The ends of the arms that grip your bike are coated with rubber, as well – for a tight hold and to protect the paint. The Michelangelo can hold two bicycles at up to 80 lbs. in total, stands 83 in. tall.The two bottom feet are about 20 in. apart and project out from the frame about 16 in. Visually, it’s unobtrusive, with a slender profile and a silver power coat finish allows it to blend in with light-colored walls. It won’t compete for attention with your bikes. We like the space-saving qualities of this rack. You really couldn’t neatly and practically store bicycles in a much smaller space – the bikes are parallel to the wall and only a little more than a foot away from it. You can place the holding hooks at any height you like, making it easy to accommodate different sizes of bikes. And if your preference of bikes should change, and everyone needs a change occasionally, you can simply raise or lower the arms to suit. One concern we have is about the durability of the rubber that grips the frame and helps to hold the bikes. If it wears out, you lose grabbing power. And it is necessary to be careful about the positioning of the arms, both for holding the bike securely and for balance. As with any type of storage unit designed to hold more than a few pounds, some reasonable caution is needed. There were also a few grumbles about the front wheel of the bike turning toward the wall after hanging and putting unsightly and upsetting black tire marks on the wall. It might be a good idea to batten down that front wheel or the handlebars to avoid this. Here is another ceiling-mounted hoist from RAD Cycle with a design that provides some added utility and versatility. 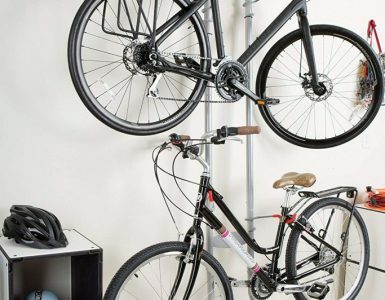 The Rail Mount Heavy Duty Bike Hoist and Ladder Lift lets you to pull your bikes up to the ceiling for storage with pulleys, but this configuration has a unique rail system that lets you change the spacing between the pulleys, accommodation different bike sizes and hanging methods. The dimensions of the rail unit are 30 x 8 x 8 in.,and it weighs about five lbs. Another special feature of this system is that you can mount the rail either parallel or horizontal to your ceiling’s joists – giving you more flexibility in positioning the lift in your garage or shop. The rail is made from heavy-gauge aluminum – so you don’t have to worry about rusting. Keep in mind that the rail-mounted hoist puts your bicycle about 10 in. from the ceiling. Add that 10 in. to the height of your bike and you will know how far it will hang down. This rail-mount hoist shares many of the design and operational features of its brother, the Bike Lift Hoist Garage Mountain Bicycle Hoist, found a few reviews up from this one.The Rail Mount Hoist offers the secure locking system to prevent any slippage of the rope holding the bikes – either during hoisting or storage. There is the same promise of an extra-thick hoisting rope for added strength. And there are rubber-coated hooks to hold your bike securely and top prevent damage to the paint. Also. similar to the Bike Lift Hoist Garage Mountain Bicycle Hoist, is the complaint about the quality of the mounting hardware included. Uses have spoken of stripped or broken heads during installation. But other proud owners of this rail-mount system have reported that using deck screws to secure the rail to ceiling joists produced solid results. A simple, inexpensive solution to a potential problem that may be well worth taking under advisement. The RAD Cycle Rail Mount Heavy Duty Bike Hoist and Ladder Lift holds one bike (or ladder, bench, etc.) and can hold up to 75 lbs. Utilitarian, simple, and straightforward, the Swagman 3 Bike Stand might be just what you’re looking for if you just want a place to stash some bikes. No frills here. It looks like a somewhat smaller version of the kind of public bike parking racks you see around town: little more than a frame and some slots for a bike wheel to fit into. This three-bike floor rack is quick and easy to set up. Slide and snap the pieces together, tighten a few bolts, and, you have a bike rack. Specs? The stand is made from heavy duty steel tubing. It measures 14 x 46 x 14 in. (WxLxH) fully assembled, and it weighs 8.5 pounds.No installation necessary – this is a freestanding rack. No surprises. It holds the bike at the wheel, and it should accommodate almost any type of bike. You can join two or more of these racks together and create a rack that will hold multiple bikes. There’s not a lot more to say about this rack or what it can do. No special instructions for use or installation. And that’s a good thing, actually. The Swagman 3-bike stand is meant to be an uncomplicated storage solution. 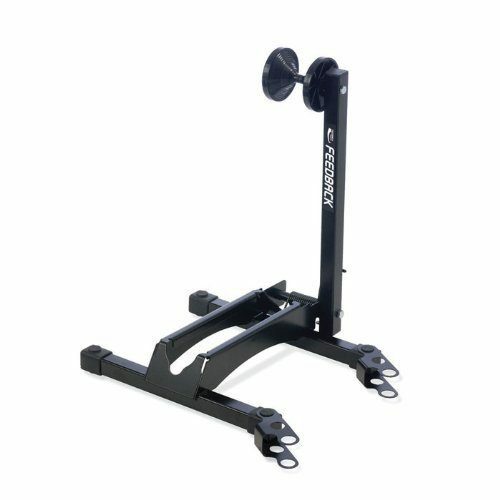 The Swagman is a perfect rack for tossing in a corner of your garage or setting up on a back porch. This would be a perfect rack for clearing up the chaotic tangle of your kids’ bikes. Or just a neat, simple way to keep your everyday commuting bikes off the floor, off the ground, clean and looking organized. A few complaints: Some users have reported problems using this rack with bikes that have disc brakes. It will depend on the size of your bike, ofcourse, but it’s something to keep in mind. Others have mentioned that the light weight of the rack allows it to slide around when putting the bike into the slot. Finally, a few have mentioned that they feel the steel tubing is not sufficiently strong to hold bikes up. They may have valid points, but the thing to remember here is that this is a simple rack, meant for easy, no-worries storage, and perhaps best used with lighter or more ordinary bicycles. You might not want to put your best mountain or road bike on it. Consider what is right for your needs. Here is another freestanding gravity rack, similar to the Delta Cycle Michelangelo above. The Pro PLB-4R Gravity Freestanding Bike Stand, by Racor,like its Delta cousin, provides a maximum of storage capacity in the minimum of space. 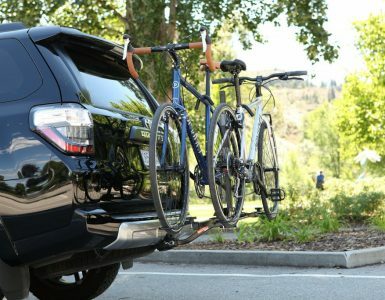 This rack can hold four bikes (up to 160 lbs.) — enough for your whole family —in a floor space not significantly larger than the footprint of two of your bikes standing closely together side by side. Some assembly is required with this stand – everything you need should be in the box. The rack is 80 in. tall,and the large, round base is 28 in. wide (parallel to the length of your bikes)and 39 in. deep, when fully assembled. The stand weighs 24 lbs. The PLB-4R is made with tubular steel and has a durable epoxy finish. Installation of the vinyl-coated cradle arms that hold your bikes will require a bit of planning, depending on the size and type of bicycles you have. You can independently position the arms to accommodate different kinds of bike frames. To give an example: Since the rack holds a bike by gripping thetop tube with its cradling arms, a women’s bike that does not have a straight top tube will need to have its cradling arms in different positions. Also, depending on the height of your bike, you should do a bit of testing to determine the best height for fitting a top and bottom pair of bikes on the rack. You want to be sure the bikes will fit, but also that you can remove each bike from the stand easily without disturbing the others. One caveat about ordering: There is a two-bike version of this rack (many of the reviews on the Amazon page for this product [PLB-4R] are talking about the 2-bike version) that is quite a different animal than this four-bike version. Be careful when reading these reviews and when ordering. This four-bike version seems to be a much sturdier piece of equipment. Also, the two-bike version can be mounted to a wall stud, the PLB-4R cannot. Its stability comes from the wide, rounded base and the weight and distribution of your bicycles. The Racor Pro PLB-4R Gravity Freestanding Bike Stand is an interesting alternative to the Delta Cycle Michelangelo. With the Racor, you get twice the capacity of the Delta at roughly twice the price. Seems fair enough. We are tempted to give the tip of the hat, however, to the Delta. The Delta can be mounted to the wall for far greater stability. Safety is good. Users report that the Racor four-bike is quite stable, though. But it might be best to keep it out of high-traffic areas, and away from places where pets and children run wild. Finally, we have the Racor PBS-2R, another simple, well, bare-bones,two-bike floor stand. Like the Swagman three-bike model above, you roll your front wheel into the slot, and there it is held by the frame and tubular steel arms. A quick fix to the bikes leaning against walls, lying on your garage floor, or flipping onto your car. You’ll need to do a little work to put the rack together—everything you need is included, as is normal for most of these products. There are two options for construction: The stand can be assembled so that you can store two bikes in the same direction (side by side) or in opposite directions (facing one another). Compact and light (a little over 12 lbs. )you can move the rack around easily. Assembled the rack measures 22.5 in.high x 23 in. wide x 22 in. deep. The space between the two holding arms is roughly 2.5 in., so keep that in mind if your bike has fat tires. There have been a few user complains about construction. Some have suggested that assembling the rack is a bit tricky. The company strongly recommends not fully tightening screws until the rack is fully assembled to make sure all parts are aligned properly. This may be the source of frustration for some people. Or rather, not following this advice might be the issue. Another complaint is that the slots are too close together to allow storing larger bikes side by side. And like the Swagman, some complain that bikes with disc brakes are not going to fit in this rack. At the Racor website, you can get this rack for $39.99. That seems a little steep to us. There are better choices at or near this price point. But it’s an easy storage solution. Very easy to handle and move around. Small and light. Good for lighter, smaller bikes. A good place to store a couple of old beaters. At this writing, the Racor PBS-2R is being offered at Amazon used for $27.99. That doesn’t seem too bad. We wouldn’t want to pay much more for it. There are a multitude of garage bike rack designs available today in the garage bicycle rack market that is suitable for a variety of general and contemporary decors. Rail Mounts– This type of mounted bike rack is typically a single bicycle system comprising of a rail mounted to the ceiling and a pulley system to enable the owner to hoist his bike to the ceiling. 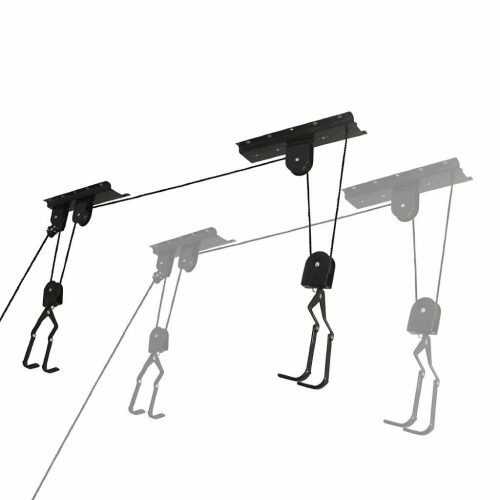 They have easy to install pulley leverage system which helps to lift and lower bikes effortlessly. Hence, women and children find it easy to use for hoisting their bikes. These designs also clears up a lot of floor space in your storage area and protects your bike from regular corrosive damage and keeps it in a durable condition for longer period. This garage bike storage system usually features a good steel framework that enables it to carry heavy-weight bikes effectively. However, be sure to check that the rope you buy for the pulley is sufficiently strong to endure leverage related wear and tear. Special rubber padded hooks hold the bike in place protecting it against scratches structural damage. Wall Mounts – A wall mounted garage bike rack is basically fitted directly on the wall using screws and bolts. Some of these wall mount bike hangerscome in tricky designs that buyers find hard to install. Use strong metal screws to ensure sturdy hanging of your bikes and keep a gap of at least 6-8 inches in-between two hangers, so that your bikes don’t get jammed together. Bar Garage Bike Storage Racks– This type of design is effective for hanging many bikes together in a row. It is most popular with professionals and large families who own individual bikes. You can typically hang 6 or more bikes in a line without hassle. This garage bike rack also clears up a lot of floor space for those who have quite a number of bikes in their possession. It comes with a robust steel body especially built for carrying heavy duty loads. Works best for mountain bikes and other smaller sports bikes. Floor and Freestanding Bike Storage Stands– This design is preferred by bike owners who can or may not drill into walls or ceilings. The independent stands allow this rack to moved and re-positioned to suit the needs of the bike owner. This mobility makes it easier for you to adjust space as per your convenience anywhere. Floor stands have a special mechanism withholding your bikes from falling over once positioned. Floor stands are without a doubt the easiest garage bike rack to use and most accessible of all bike storage stand systems. Powder Coat– These come in various colors. The dry powder coating provides sturdy skeletal protection against weather changes and has a high glossy facade. Zinc Coat– Also called galvanized coating. Mostly inexpensive yet provides an excellent corrosion resistance against weather and other minor impediments. It has a dull appearance. Cast-Off Plastic Coat– It is mostly made from recycled plastic materials and is environment friendly. Stainless Steel– Considered one of the best hard-wearing materials with high corrosion guard and glossy attractive exterior. It is also simple to maintain and use and perfect for garage bike racks. The installation procedure of any type of garage bike rack is pretty crucial, so spend some time and do it right the first time to protect you bike and other items in the garage. The place of storage and optimum utility of the rack determines the modus operandi of the equipment in use. Therefore, selecting a good location is a vital part of the installation process.Select spaces according to the type of rack you are installing at your home or garage. Pick a safe spot where there will be fewer people or pets passing through. This enhances the safety of the area. Also ensure the locking mechanism of your equipment is correctly installed so that it doesn’t fall and cause unnecessary damage or injury. Like any product where you will find an astonishing range of styles, sizes, configuration, features, and functions, the first step in choosing a bike storage rack is deciding what you want and need. You should also keep in mind where you will use the rack: Is it for your garage where a tough utilitarian look and maximum functionality is key? Or is the rack a place to display your prized street or racing bikes? Are you planning to move the rack around, perhaps bring it along on a biking trek into the great outdoors? Or do you want a more permanent fixture? Put a little time into thinking about it. But be flexible. A design you thought was perfect for your tightly packed garage may have hidden drawbacks: too large or small, not enough features, etc. No assembly required, ready to use out of the box. This rack is solid, stable, portable, and dependable. Great value for the price. A real powerhouse of a rack. Versatile, easy to use. Gets bikes off the floor, up in the air, and safely out of the way. And, again, a great value for your dollar. A bit pricey, but the Velo Cache is a solid space-saving solution, and a fine-looking product in the bargain. Great for displaying your prized bikes. It can’t always be about money. It doesn’t get more practical than this. 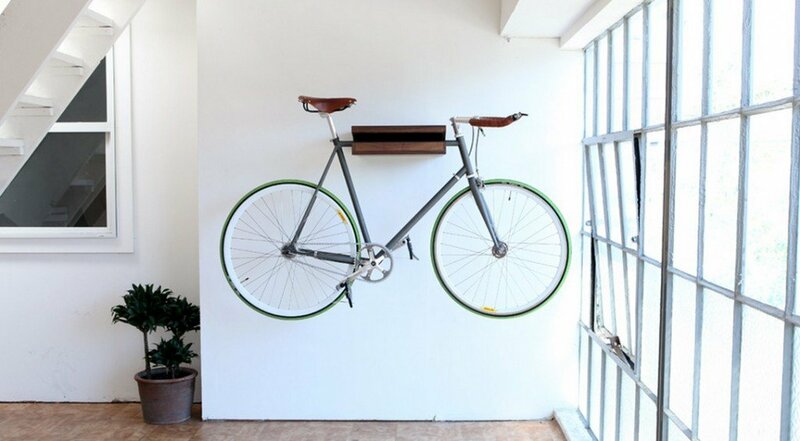 Makes a blank wall or empty hallway into storage for your bikes. And it’s super affordable. There we go thinking about money again.